Maybe it's an age thing, but I've found myself obsessed with the TV series LIfe on Mars, which is of course set in 1973, the year I went to university. I've been watching the DVDs with the family, shouting out things like "that's a Ford Cortina 2000E! One of my first girlfriends' dad had one of those!". Having been in Glasgow for the last week, staying in the west end, I've been revisiting some of the scenes of my (highly reputable, apart from the curries)university years. One thing I missed yesterday during a perambulation through Kelvingrove Park was the overwhelming aroma of curry that used to waft from Gibson Street. But the notion that you could have a capuccino by the Kelvin (from the excellent Big Blue) was unthinkable in 1973, when the Kelvin was (even more) nasty and noxious and that walkway didn't exist. Anyway, yanking me back to another era was my boss Jeff Zycinski in his blog yesterday. To be precise, 1996, and the Tom Morton Show (Version II; we're on Version III these days...or is it IV?). Jeff had unearthed a video taken during our trip to Hollywood to broadcast live for a week (from a studio deep in the heart of East LA's gangland, at 3.00 am)and a publicity shot which makes me look like Gene Hunt (from Life on Mars) only with serious haemorrhoid problems. But, it has to be said, with a great deal more hair. Than I do now, that is. Gene seems plentifully hirsute. Though who knows what he'll look like in the Life on Mars sequel, apparently set in 80s. Enough nostalgia! It just ain't what it used to be. Or perhaps it is. Where can I find some Cremola Foam, a camel hair coat and a Ford Capri? Just in case you were wondering, the reason I'm still in Glasgow is that I'm on holiday and well, this is as far as I'm going to get. It's a complicated business, holidays in our family. James (who has been here in Glasgow with Susan and Martha and me for the past week) is now off to the National Youth Orchestra with his double bass and for the next fortnight will actually have to do some practising before heading off to do glamorous gigs in Berlin and Amsterdam. 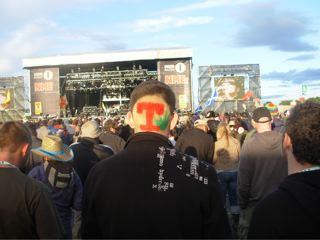 As well as in Scotland and indeed on that proud proclaimer of the airwaves, BBC Radio SCotland. Stravaigin 2 (Ruthven Lane): Fabulous burgers, best chips I've ever tasted, remarkably good value. North Star (Queen Margaret Drive): Erratic service but some of the best coffee in town...great scones and the eggy bread with crispy bacon is to die for. Ichi Ban (Queen St): The full-on, communal, neon/urban Japanese experience. Fresh, fast and the Ramen rocks. Wagamama (off Nelson Mandela Place): Somewhat sanitised Japanese/Cantonese fusion, with a curious absence of sushi. Dearer than Ichi Ban. Good and good fun, but the automatic addition of forks and spoons is indicative of the cooking's compromise. Spice Magic (Queen Margaret Drive): One of those carry-outs that does everything from kebabs to fish suppers through every conceivable curry. Fab value and everything we had was good. Beanscene: Always good coffee and atmosphere, though it's not cheap, Tam! Pizza Express: Susan hates pizza, and I've only just found this out after 19 years of marriage. But I love Pizza Express, especially that Espresso Royale thing with figs and mascarpone. Just picked up my venerable Honda GL500 Silverwing from Clydebank today, and the folk at Gremlins having sorted out the front brake, I rode it back into Glasgow. Which was fine, if slightly nerve-wracking. Not as nerve wracking as this video, though. It was sent to me by Colin Fraser of the excellent Shetland Island Cruisers, and shows some very, very committed riding indeed on one of the classic biker routes in the USA: Deals Gap which runs through Tennessee and North Carolina for 11 miles and, ahem, 318 corners. The amazing thing is that both the cameraman and the rider he's filming were on GL1800 Honda Goldwings, enormous, everything-including-the-kitchen-sink cruisers. Listen out for the scraping noises. We have pub! Hotel! Twelve jobs! Possibility of pint within 200 yards of front door! The St Magnus - or, if you will, St Magnus Bay - Hotel, closed for three years, has been sold and will reopen! Meaning that we will now have a local pub! Well, thanks a million to Niall and Jenny, main co-conspirators in last week's tour of the east coast, along with guest appearances from Fiona and Lynne. And thanks too to the many listeners who came along to see what all the fuss was about, the various guests (from garlic and beef jerky producers to seabird spotters and spiritual golfers)and our musicians - Dropkick, James Yorkston, Esther O'Connor, Richard MacIntyre (AKA Urban Joe) and the Galipaygos. Nice piece in the motoring section of the Sunday Mail about it, as well as coverage in various local newspapers. 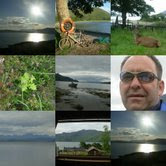 The picture collage shows some of the highlights. But where should we go next year? How about a floating tour, aboard a cruiser going along the Great Glen? Suggestions please. Meanwhile, I'm now on my holidays! bedraggled. Now, though, it's looking and feeling quite buoyant. weeks! We're at The Links from 2 until 4.
the sun is shining...what a fabulous beach! It's a glorious day in St Andrews and I'm recovering from a night in a hotel with the smallest bedrooms outside of a Tokyo capsule hotel. Good steak last night at Greyfriars. The whole business of travelling by train with a folding bike is, if not a nightmare, not pleasant. It's like having the heaviest pushchair in the world with you. Still, it was a lovely five-mile run from Leuchars to St Andrews last night, cycle path the whole way. Yesterday's live show in North Berwick went well, with some nice tunes from Dropkick, and today we're set to take up residence in Church Square from two until four, with special guest James Yorkston. then it's back to Leuchars for the train to Stonehaven, where we do the show tomorrow. It's£4.10 for a pint at the Marine Hotel in North Berwick! Last week of broadcasting before I have four weeks off, and it's a humdinger: Tom's Folding Tour (why did I suggest this?) 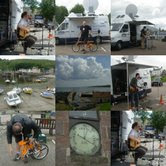 involves five outside broadcasts, using satellite, with live music and other guests. Thing is, I will be travelling by folding bike (the Downtube FS IX, see below) train, bus, foot and, quite possibly, hovercraft (there's an experimental hovercraft service starting next week I might be able to use. It's uh, complicated. But my carbon footprint will be low! Or small. As for the satellite van...let's not mention that. Friday, Nairn, The Links, with The Galipaygos. ...and if you want to read Louise Tickle's Guardian profile of my working existence, it's available online here. Jakob Nielsen is the world's pre-eminent thinker on how the internet works, and ought to work better. He is ahead of the loop. 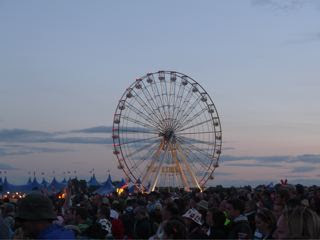 This article made me feel rather ill.
T in the Park photies later...meanwhile, it's a pink seagull! In Thurso, apparently. But how? K Thomson took this snap in the course of his bespoke tour leading operations. ...Louise Tickle has just texted me to say that a profile she wrote of me for The Guardian's Work section is published today. Don't think it's available online. 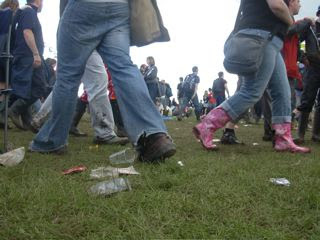 Off to T. Weather seems to have improved, he said cautiously. Under strict instructions from Martha to obtain wellies that were 'interesting', ie not green or black, I finally tracked down a pair of purple striped ones in Clydebank this morning. I picked up a golfing umbrella but all attempts to hire a 4X4 (except for an offer of a Volvo XC70, which is too posy and at £200 a day was a bit expensive, and a Ford Ranger pick up, which doesn't have enough seats or will hold a cello safely)err...failed. So it's Berlingo to Balado, in the hope that the trusty Citroen's front wheel drive will cope with whatever depth of mud there is. Meanwhile, off to QMD once more for the last TM Show of the week. ...leafy beyond belief, at least to someone living in the (mainly) treeless Zetlandics. Meanwhile, I was totally charmed by that Cherie Blair documentary. Hey Tony! Missing you already! He refused treatment for lung cancer, apparently, so he could continue singing. Now that, my friends, is rock'n'roll. Or jazz. Brilliant writer, art connoisseur, drinker and musician. They don't make 'em like that anymore. Heading south with Martha (who was 13 yesterday) as she has to attend National Youth Orchestra rehearsal (she's a cellist. 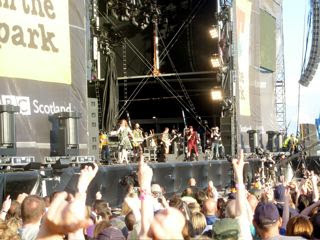 And then on Saturday, by way of contrast, we have tickets for T in the Park. Ghost blogging has arrived! At last a way to make money out of blogging! I was tempted to use a motorbike for our east coast broadcasting ramble at the end of July, but really wanted to cycle again. However, the distances (can't reveal the exact locations yet, I'm afraid) are too great to allow that. Well, some of them are. 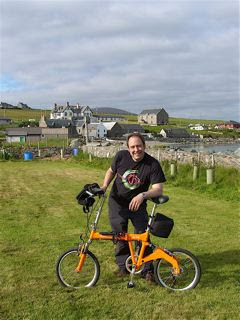 So the plan is to go as green as possible and use public transport plus a folding bike. I bought the Downtube IX a few months ago ( designed by the amazing Professor Yan Lyansky) and through bitter experience on the last bike ride, have made a few modifications: new inner tubes ('smart' tubes, containing a green sealant called, ahem, Slime which promises to seal punctures instantly); a new saddle (a Trek gel-filled ultra comfy affair); new folding pedals (the old ones were rubbish); a 'hanger banger' to protect the derailleur when the bike's folded, and tougher skewer nuts. Also a set of miniature LED lights. I also have lycra cycling gear, but that is not for public consumption. Still no broadband, despite upgrading to unlimited downloads on Saturday. Account has been suspended due to breaching of download limit, the result of having three games-playing weans at home for the summer. See today's Sunday Post for more. And all this just when it would have been good to surf'n'listen'n'YouTube about what has been going on (and still is) in and around Glasgow Airport. Houston, where a house is currently sealed off and being searched by police, has a great wee pub/music venue where we looked at doing a TM roadshow. It'll be hoaching with hacks even as I write. 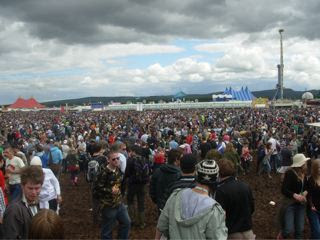 Just seen some telly coverage of the queuing at the airport...hell's teeth! It'd be off to Arran for me.